An Apocryphal tract, placed, in the Septuagint and Theodotion, among the additions to the Book of Daniel (see Apocrypha). It consists of two separate stories: one relating to Bel; the other, to the Dragon. In the former, Daniel, by a clever device, exposes the trick by which the priests of Bel made it appear that the idol consumed the food and drink set before it. In the latter, Daniel slays the Dragon-god by putting into its mouth cakes made of pitch, fat, and hair, after eating which it bursts asunder. Daniel is thereupon cast into a den of lions, but remains unharmed by the beasts, and is fed by the prophet Habakkuk, who is miraculously brought from Judea for that purpose by an angel. The purpose of the stories is to ridicule idol-worship, and to extol the power of God, who preserves His faithful servants in all perils. The material is drawn from current ideas and legends. Bel was the central figure of the Babylonian idolatry (Isa. xlvi. 1; Jer. li. 44), and the Exile the type of heroic struggle. The myth of the contest between God and the Dragon (Tannin, Rahab, Leviathan) occurs throughout the old post-exilic literature (Gunkel, "Schöpfung und Chaos"); and the way in which Daniel destroys the Dragon is similar to that in which Marduk destroys Tiamat (Delitzsch, "Das Babylonische Weltschöpfungsepos"; compare Nöldeke, "Geschichte des Artachsir i Papakan," 1879, p. 55). Marduk drives a storm-wind into the dragon and thus rends it asunder; and Marshall (in Hastings' "Dictionary of the Bible") suggests that the "pitch" of the Greek (Aramean, ) may have come from an original term for "storm-wind" (Aramean, ). How the prophet Habakkuk came to be introduced into the story is hardly possible to explain (see Habakkuk). 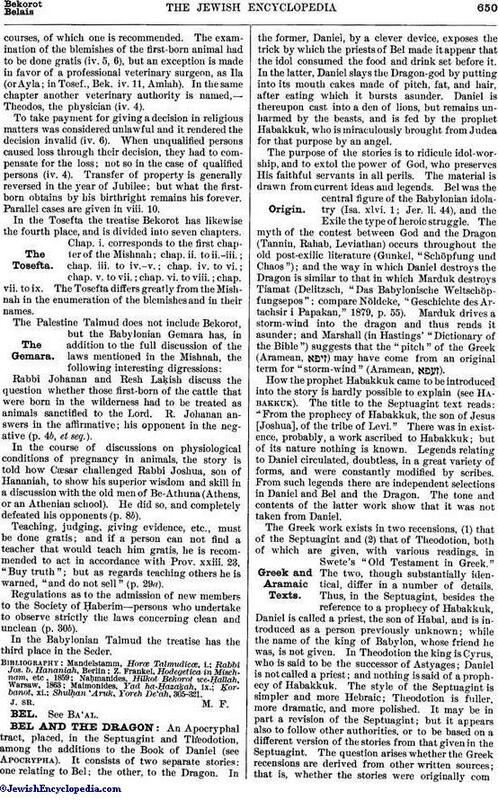 The title to the Septuagint text reads: "From the prophecy of Habakkuk, the son of Jesus [Joshua], of the tribe of Levi." There was in existence, probably, a work ascribed to Habakkuk; but of its nature nothing is known. Legends relating to Daniel circulated, doubtless, in a great variety of forms, and were constantly modified by scribes. From such legends there are independent selections in Daniel and Bel and the Dragon. The tone and contents of the latter work show that it was not taken from Daniel. The Greek work exists in two recensions, (1) that of the Septuagint and (2) that of Theodotion, both of which are given, with various readings, in Swete's "Old Testament in Greek." The two, though substantially identical, differ in a number of details. Thus, in the Septuagint, besides the reference to a prophecy of Habakkuk, Daniel is called a priest, the son of Habal, and is introduced as a person previously unknown; while the name of the king of Babylon, whose friend he was, is not given. In Theodotion the king is Cyrus, who is said to be the successor of Astyages; Daniel is not called a priest; and nothing is said of a prophecy of Habakkuk. The style of the Septuagint is simpler and more Hebraic; Theodotion is fuller, more dramatic, and more polished. It may be in part a revision of the Septuagint; but it appears also to follow other authorities, or to be based on a different version of the stories from that given in the Septuagint. The question arises whether the Greek recensions are derived from other written sources; that is, whether the stories were originally composedin Aramaic. Aramaic forms of the legends do, in fact, exist. Raymund Martini (1250), in his "Pugio Fidei" (at the end of the book), cites from a Midrash on Genesis a part of what is contained in the Greek text. His accuracy has been called in question, but Neubauer (in his "Tobit") gives, from a manuscript in the Bodleian Library (the Midrash Rabba de Rabba) a Syriac text with which that of Martini is identical, and a parallel extract from the Bereshit Rabbati. From another manuscript in the same library, M. Gaster has published a text of the Dragon story that confirms the correctness of Martini's quotation. The Aramaic text of this manuscript is printed in the "Proceedings of the Society of Biblical Archæology" for November and December, 1894; and the English translation of a long paraphrase is given by Gaster in his "Chronicles of Jerahmeel," 1899. In the Introduction to the latter work, Gaster discusses the relations of "Jerahmeel" to "Yosippon," "Sefer ha-Yashar," and the "Antiquities" of Pseudo-Philo. The Jerahmeel Aramaic text is nearer to Theodotion than to the Septuagint; though it sometimes accords with the latter or with the I atin against other forms, and sometimes differs from all others. But in the present state of knowledge it seems better to reserve opinion as to its antiquity. Gaster thinks it is the text after which Theodotion's version was revised, and Marshall regards it as ancient. The occurrence of the stories in the Midrash makes it probable that there was an Aramaic original; but it is not clear that this is preserved in the texts cited. 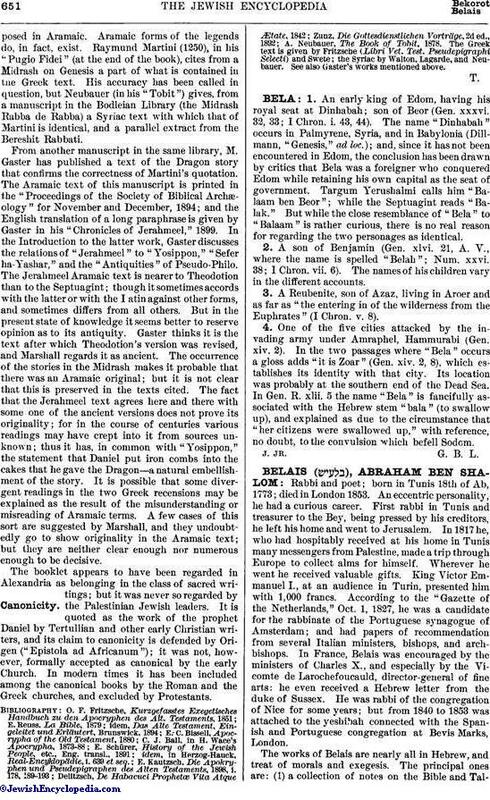 The fact that the Jerahmeel text agrees here and there with some one of the ancient versions does not prove its originality; for in the course of centuries various readings may have crept into it from sources unknown; thus it has, in common with "Yosippon," the statement that Daniel put iron combs into the cakes that he gave the Dragon—a natural embellishment of the story. It is possible that some divergent readings in the two Greek recensions may be explained as the result of the misunderstanding or misreading of Aramaic terms. A few cases of this sort are suggested by Marshall, and they undoubtedly go to show originality in the Aramaic text; but they are neither clear enough nor numerous enough to be decisive. The booklet appears to have been regarded in Alexandria as belonging in the class of sacred writings; but it was never so regarded by the Palestinian Jewish leaders. It is quoted as the work of the prophet Daniel by Tertullian and other early Christian writers, and its claim to canonicity is defended by Origen ("Epistola ad Africanum"); it was not, however, formally accepted as canonical by the early Church. In modern times it has been included among the canonical books by the Roman and the Greek churches, and excluded by Protestants. A. Neubauer, The Book of Tobit, 1878. The Greek text is given by Fritzsche (Libri Vet. Test. Pseudepigraphi Selecti) and Swete; the Syriac by Walton, Lagarde, and Neubauer. See also Gaster's works mentioned above.